I found this wedding dress awhile back and after multiple cleanings I was able to restore it to a brilliant white. 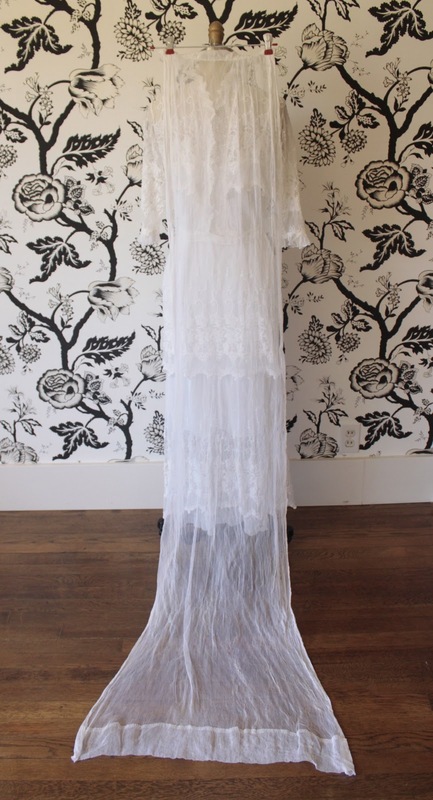 What is so special about this dress is that it included the veil, millinery flowers and a handwritten note that said "This is Mother's wedding dress, veil and accessories..." and went on to say the names of the bride and groom. This dress is absolutely beautiful and is almost 100 years old! I am amazed at the durability of this dress, it has no holes or tears and I was able to handle it extensively and it has still retained it's strength. Another neat thing is that due to the type of fabric, it can be worn two different ways. The original style is the high neckline as shown in the first two photos, but I can also imagine this dress being worn backwards as I have shown in the third photo, for a completely different look. For more info on this dress, refer to the listing. jaw-dropping. this made me almost start to cry, the note? unreal! just, wow. What an amazing find. You are just the right person to restore this dress to its former glory. What a beautiful dress, and the note~what a true find!!! !